(VEN) - Artisan Phan Thi Thuan in Phung Xa Commune is a pioneer who has devoted her life to the pursuit of unique silk product lines. Her best-known endeavors are “training” silkworms to weave blankets; her latest venture is making silk fabric from lotus stems. Born into a family of weavers in the village of Phung Xa in Hanoi’s My Duc District, Thuan has been fascinated by the silk-making process since she was a child picking mulberries and raising silkworms. In the 1970s, she says, tens of thousands of hectares of mulberry fields dotted the area, which was considered the “capital” of mulberry farming and silkworm raising in northern Vietnam. Most communes in My Duc District were engaged in mulberry farming and silkworm raising. However, the 1980s were a most difficult period for Phung Xa in particular, and traditional textile villages, in general. Farmers were unable to sell their silk products and shifted their mulberry fields to other crops, while looms gathered dust. Thuan was an exception. With her strong passion and love for silk, she was obsessed with the desire to find a more simple and efficient way to keep the traditional craft alive. After tossing and turning on numerous nights, Thuan came up with an idea: Why not use silkworms to produce the fillings for blankets? How can I make silkworms weave the stuffing instead of secreting the silk to form their cocoons? She spent over a year conducting experiments, staying awake through the nights for over a month to create a strange silk weaving method. Rather than leaving the silkworms to secrete their silk into cocoons, she let them release their silk threads on a flat surface. As a result, after four or five days, the silkworms formed a flat cocoon. The pods were then boiled for four hours and processed to create smooth material. 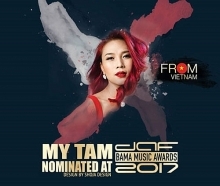 The initiative for “self-weaving” silkworms brought her the first prize in a 2015 nationwide creative farming contest organized by the Vietnam Farmers’ Association. Once the process was perfected, Thuan went on to make pillows, suits, hats and scarves from this silk. Today, her products are available in many countries, such as Japan, Thailand, Germany, Belgium, China, and Saudi Arabia, bringing in after-tax profit of more than VND3 billion a year. Several years ago, Thuan was approached by Tran Thi Quoc Khanh, a member of the National Assembly representing Hanoi who is a scientist at the Institute for Ecological Economics. Khanh told her about a unique method used in Myanmar to create another kind of silk fabric. It is based on lotus plants, the stems of which are cut open to extract the cellulose threads from within. The threads are then woven together to create a fabric known for its durability and floral scent. Thuan’s village has many lakes and ponds with abundant lotus flowers, and she decided to give it a try. After two years of conducting research and experiments, Thuan introduced the first scarf made of lotus silk in January 2017. She realized that she would have to process the stems within 24 hours, because if lotus stalks dry out, their “silk” would be ruined. The new fabric is environmentally friendly, but its manual manufacturing and the precise work involved consumes time and effort and makes the lotus silk very expensive. On average, a hardworking and skilled worker can process 200-250 lotus stalks a day. It takes about one month to complete a scarf. 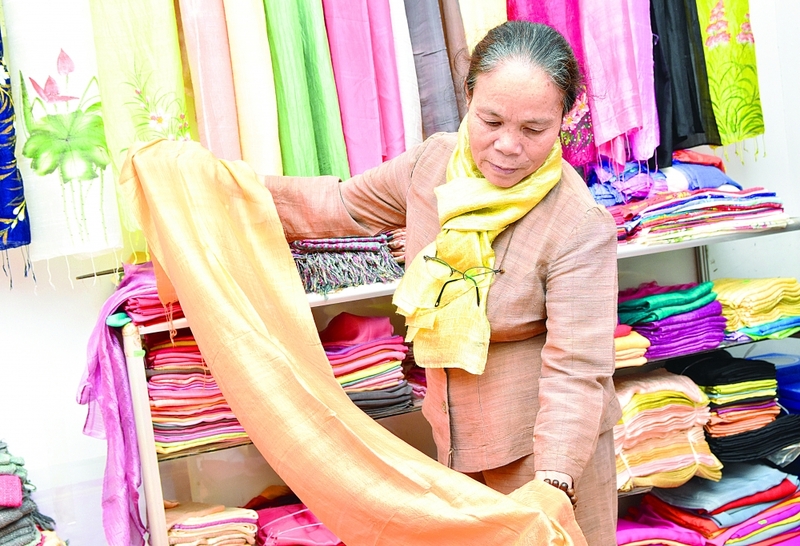 A scarf 1.7m long and 0.25m wide requires 4,800 lotus stalks and costs about VND5 million. Thuan hopes to create silk using a fusion of the two materials, which should result in a more affordable product.